Being involved in a trucking collision can be frightening and even fatal. According to the Federal Motor Carrier Safety Administration (FMCSA), about 400,000 large trucks are involved in a crash annually across the U.S. and approximately 70,000 of those involve a rear-end collision. This number includes 2 types of rear-end crash those where the large truck strikes another vehicle, and those where the large truck is struck. Unfortunately, either type of accident can lead to severe injuries. A commercial truck can be up to 40 times heavier than other vehicles on the road. If you or a loved one was rear ended by a semi truck or ran into the back of a truck because of reasons that were due to another drivers negligence, you may be eligible for compensation for the damages you have suffered, including lost wages, medical bills, property damage and more. 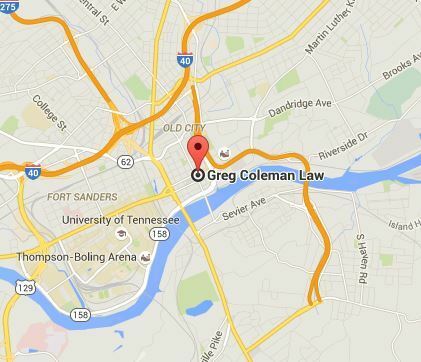 The attorneys at Greg Coleman Law can help you pursue justice in a personal injury case if you have a claim. Find out whether you have a claim today simply fill out the Free Case Review form to your right to get started. Nearly half of all rear-end collisions that led to a traffic fatality occurred when a truck was hit by another vehicle in dark road conditions, rather than a vehicle being rear ended by a semi-truck. In order to avoid being in a tragic crash, it is wise for Tennessee drivers to be aware of the common causes of rear-end crashes with trucks. When a semi-truck is rear-ended by another vehicle, and especially when underride occurs, there is no other type of truck accident more likely to end in fatality. If you lost a loved one in a tragic Tennessee trucking accident, you could be eligible for a wrongful death claim to pursue compensation for the loss you have suffered. Unfortunately, nearly 425 die each year after being involved in a rear-end accident with a large truck, according to the National Highway Traffic Safety Administration. Over 5,000 are injured in collisions where a truck is rear-ended, or vice-versa. Despite advances in safety and design in both large trucks and passenger cars there are still insufficient safeguards for a passenger vehicle in the event of a rear end accident with a tractor-trailer. When a passenger car strikes the back of an 18-wheeler, the car can slide underneath the trailer of the vehicle; even at low speeds, the cars roof is likely to peel back until the vehicle strikes the trucks tires. This is called an underride accident, and it can cause morbid injuries such as decapitation. In an underride collision, the bottom of the trailer meets with the cars windshield, and the thin pane of glass, along with the cars roof pillars, is the only form of protection for the occupants. To reduce the damage done in such crashes, many trucks are required to have an underride guard; unfortunately though, they do not always function correctly. Although the guards fail often, the Insurance Institute for Highway Safety (IIHS) would like to see underride guards made an industry-wide regulation, and have petitioned the NHTSA to create stronger standards. Underride protection may have first been mandated in the 1950s, but 60 years later, the minimum requirements in place hardly protect passengers. Until the industry becomes more concerned about the underride issue, it is hard to imagine regulations improving. Hitting a large commercial vehicle or being rear ended by a semi truck can be devastating, cause life-threatening injuries, and even death. The staff at Greg Coleman Law understands that most truck accident claims are complex, and require skill, knowledge and experience. In some cases, there may be multiple parties liable for a trucking wreck. Call a Knoxville personal injury attorney at (865) 247-0080 to discuss the merits of your case and establish whether you have a trucking accident claim. To get started immediately, simply fill out the Free Case Review form at the top of this page and you will be contacted by one of our compassionate, knowledgeable legal staff members.